I like to make paranthas quite often especially in the winter months, more so when there are so many types of paranthas that one can make. 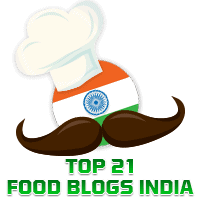 You will therefore find multiple recipes for paranthas in this blog, such as Oats Masala Parantha, Spring Onion Parantha, and the ever popular Aloo Parantha. 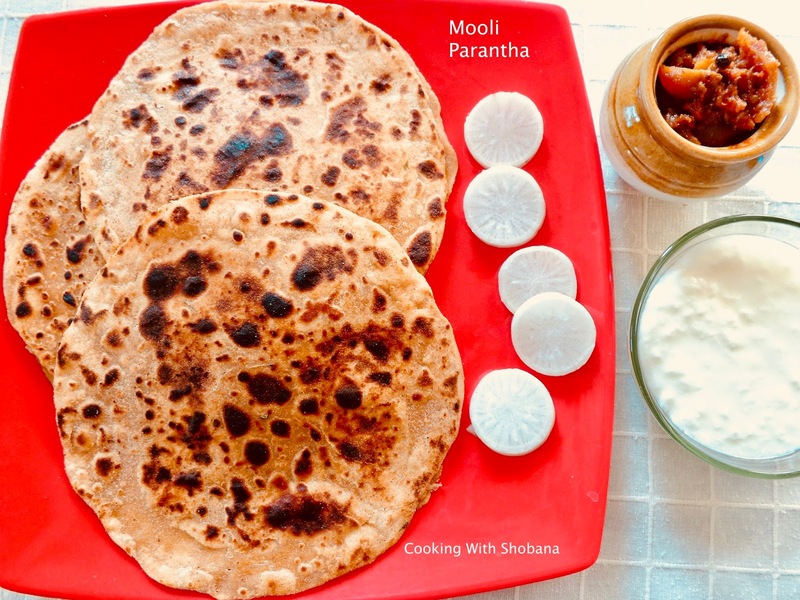 Today's recipe is for Mooli Parantha made using radish which is called Mooli in Hindi. In Kannada and Konkani we call it Mulangi. This vegetable has numerous health benefits and is fairly easily available. Broadly, there are two methods to make paranthas. In one method, you can roll out the chappati and place the stuffing in the centre, then draw the edges to the centre, roll it out dipping it in the dusting floor and finally cook the parantha. In the other method, you can make two chapptis of the same size, keep the stuffing in the centre of one of them leaving space along the edges, cover it with another chappati and then seal the edges and cook the parantha. For making Mooli Paranthas, I have today used the second method. Do remember that the radish has moisture content and gives off water when it is grated. The quantities mentioned in the recipe yielded 3 mooli paranthas ( made with 6 chappatis and stuffing as explained in the Method). To the grated radish, add coriander powder, amchur, red chilli powder, grated ginger, chopped green chili, chopped coriander leaves and salt. Mix well and keep aside for about 10 minutes. Next, squeeze the grated radish and keep the juice aside. This juice can be used while kneading the dough for the parantha. Place the wheat flour in a large bowl, add 1 tsp of oil and a little salt. Add the mooli juice kept aside and the required water little by little to knead the dough. Make sure the dough is neither too stiff or too soft. Cover the dough and let it rest for 20-25 minutes. Grease your hands and knead the dough again till smooth. Take one of the portions, dust it with atta, and roll it out to make a chappati. Similarly, make another chappati with one more portion of the dough. Serve hot with curds, pickle or curry of your choice.